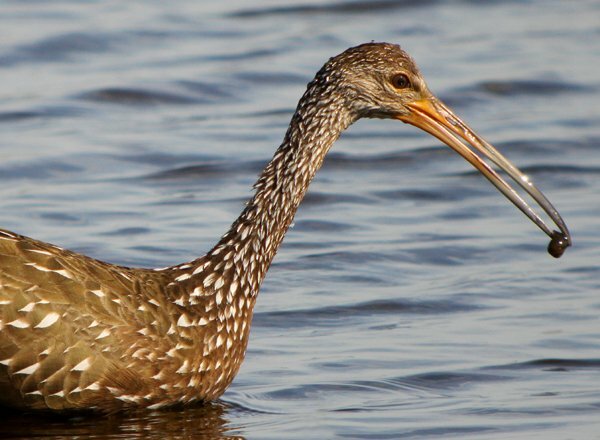 Limpkins are Apple Snail specialists. That is, they eat snails of the genus Pomacea to the exclusion of all else, provided the snails are available. And while finding snails is not difficult for a long legged bird that is not afraid to wade into alligator-infested marshes it is difficult to extract the yummy snail meat from its protective shell. Fortunately, Limpkins learn quickly, and watching one remove a snail from its shell with only the use of a beak is impressive. I had the good fortune to watch just that happen at the Viera Wetlands one day this past week. The snail was not very large but I was impressed with the size of the chunk of snail meat hiding in the recesses of the shell. 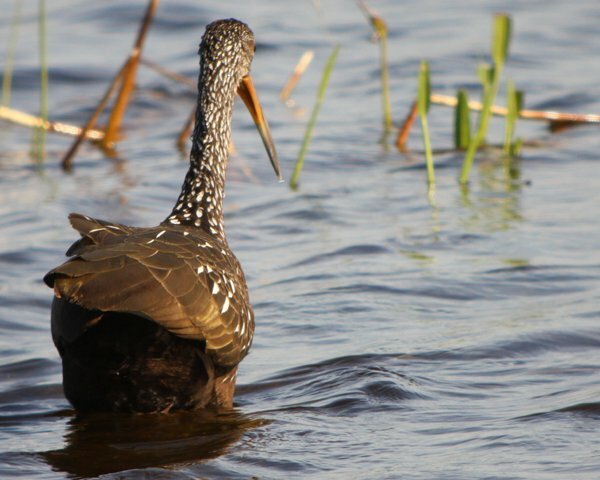 Want to see a Limpkin eating a snail? Then scroll down! 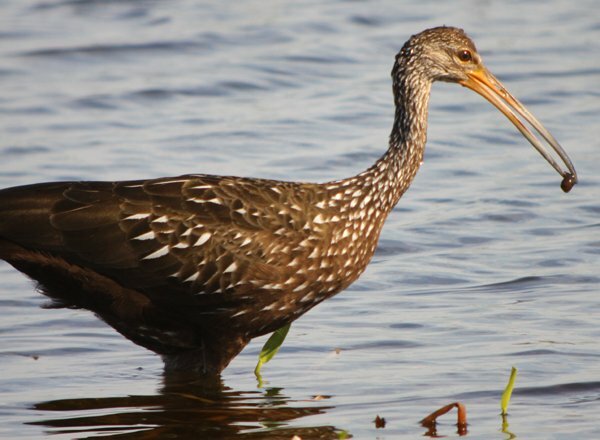 The Limpkin is the only bird in the family Aramidae, which shares the order Gruiformes with the rails and cranes. 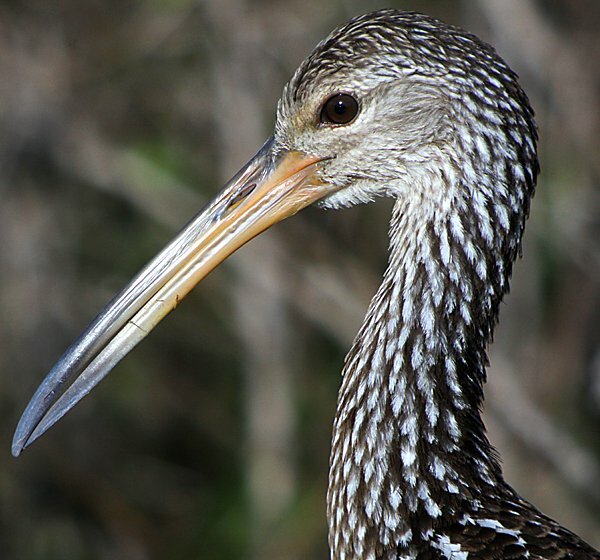 There is no other bird quite like a Limpkin for which the snails of Florida are very grateful! Now the Limpkin finds a good place to process its lunch. It’s tricky to get the meat out! If you liked these images make sure to head on over to 10,000 Clicks, the 10,000 Birds photo-galleries page, and see our growing collection of galleries. I read somewhere that most Apple Snails in Florida are now invasive species from Latin America. You can’t count a bird for your year list that is entirely dependend on escaped invasives. There is not enough information yet to conclude that invasive island applesnails are more abundant than the Florida applesnail. But I am happy to say that I have not yet found the island applesnail at Viera Wetlands. They sure have invaded the Loxahatchee River and many other places.